Thirty years after the defeat of the Death Star and Lord Vader, the galaxy faces a new threat in the form of the First Order and the evil Kylo Ren (Adam Driver). When a rogue storm trooper, Finn (John Boyega), escapes the Star Killer base, he crash-lands on desert planet, Jakku, and meets Rey (Daisy Ridley), a tough scavenger harbouring a droid containing a top-secret map. In order to hide from the First Order, the young duo join forces with Han Solo (Harrison Ford) to make sure the Resistance receives the intelligence concerning the whereabouts of Luke Skywalker (Mark Hamill), the last surviving Jedi Knight. Straight in at Number 1 -You guessed it. How could I not feature this in my Top 5 of all time? I told myself I wouldn't review The Force Awakens for it is a film far greater than all of us combined. Whether you're a Star Wars fan or not, you have to appreciate that such a release is a historic moment for the film world. There was much speculation and hype towards the first Star Wars production in nearly 10 years with trailers and teases released through the year. Since the unfortunate creations of Episode I-III (which we do not speak of) many were unsure of what to expect but, in true JJ Abrams style, he brought it back to the standard it should be and then some. Though not entirely without it's flaws, it completely embraces the nostalgic qualities of the original trilogy whilst paving the way for a new generation. My film of the year. 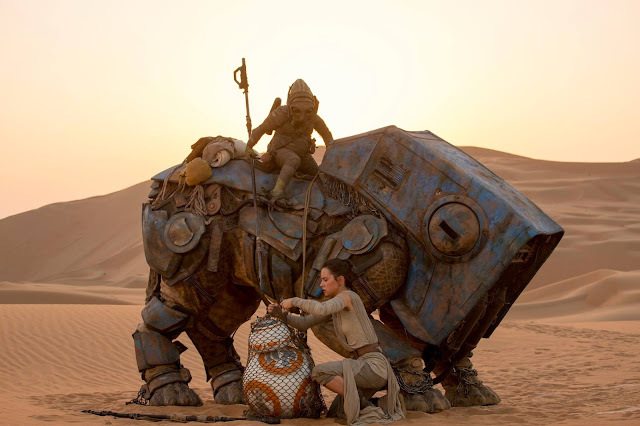 Star Wars: The Force Awakens gets a Sophie star rating of 5 out of 5 stars. Outstanding! Twenty-two years after, the now forgotten, events of Jurassic Park, Isla Nebula is now a successful and fully functioning theme park complete with living dinosaurs and attractions. Feeling a need to enhance spectators' interest, the park's scientists have cooked up something with "more teeth" and Jurassic World is getting ready to unveil it's first genetic hybrid dinosaur. However, having learnt nothing from raptors in the kitchen, playing with Mother Nature can only have devastating repercussions. It's impossible to have a Top 5 list without featuring one of the most successful films of all time and furthermore, a record breaking box office release (which was then stolen by Star Wars: The Force Awakens). Jurassic World gets a Sophie star rating of 4 out of 5 stars for literally reducing me to tears of pure joy. I'm already planning on seeing it a second/third time. 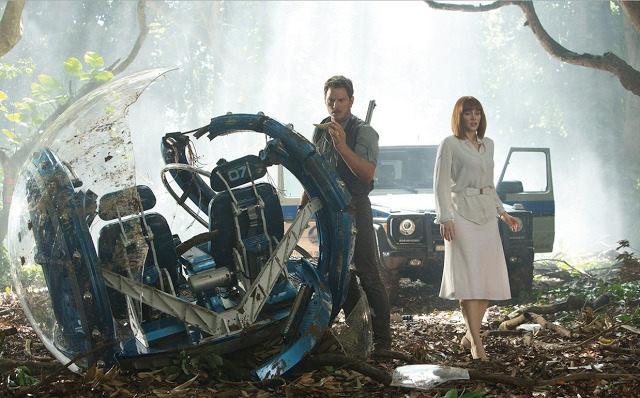 You can read my full review of Jurassic World here. Sneaking in by the skin of it's teeth having been released in the UK on January 1st, is Birdman or (The Unexpected Virtue of Ignorance). Under pressure from family (Emma Stone), dysfunctional cast members (Edward Norton) and his lawyer (Zack Galifianakis), Riggan Thompson (Michael Keaton) is a fading star trying to regain his former glory. Having made his fortune as the star a former superhero franchise, Riggan attempts to direct and star in a Broadway production adapted from a Richmond Carver novel in a final bid at a career revival but his ego and cracking psyche haunt him. With an all round well-written screenplay, stunning cinematography and cast performances, including some incredible scenes of classic Edward Norton resulting in 9 Oscar nominations and 4 wins including Best Picture. 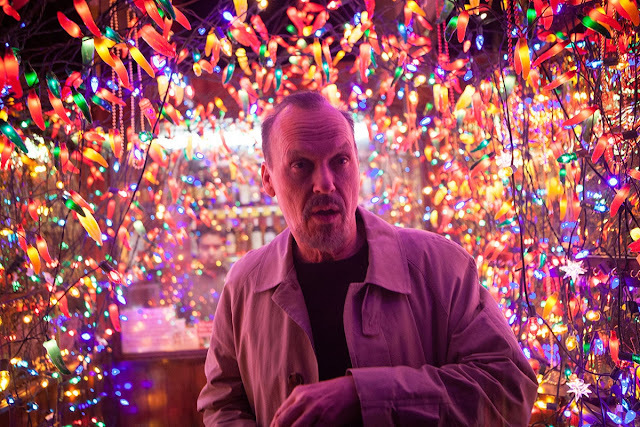 Visually pleasing, tantalising, explosive, emotionally and intellectually challenging and ultimately, hilarious - Birdman (Or The Unexpected Virtue of Ignorance) gets a Sophie star rating of 4 out of 5 stars. Long may Keaton reign! You can read my full review of it here. A cheeky entry is Whiplash. Technically, it's 2014 like Birdman, but for the UK this wasn't released until early 2015 and so I've decided to keep it in there anyway. Whiplash took home the Oscar for Best Actor in a Supporting Role back in February and it could not have been more deserved - utterly thrilling fro start to finish, Whiplash gets a Sophie star rating of 5 out of 5 stars. You can read my full review of it here. 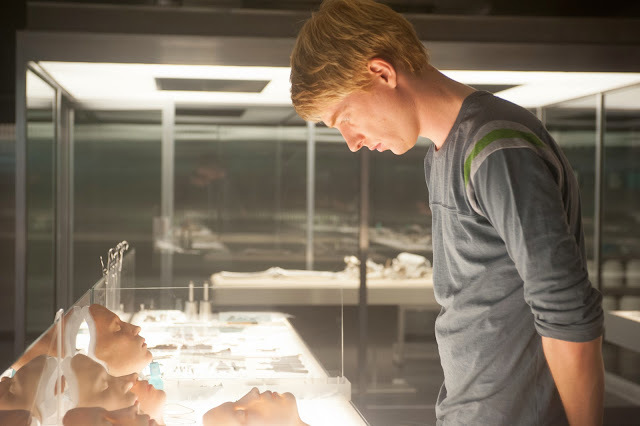 A young computer programmer, Caleb (Domhnall Gleeson), wins the opportunity to spend a reclusive week with the CEO of his company, unaware that he is participating in a breakthrough experiment in artificial intelligence. When he arrives in the remote utopia, he meets a fascinating female A.I, Ava (Alicia Vikander), but when learns more of his boss, computer genius, Nathan (Oscar Isaac), it soon transpires that he is not there by chance. Though not entirely without faults, Ex-Machina is a stunning piece of sci-fi drama with beautiful cinematography and a wonderfully directed by Alex Garland. Satirically creepy, stylish and utterly tense, Ex Machina gets a Sophie star rating of 4 out of 5. You can read my full review of it here. 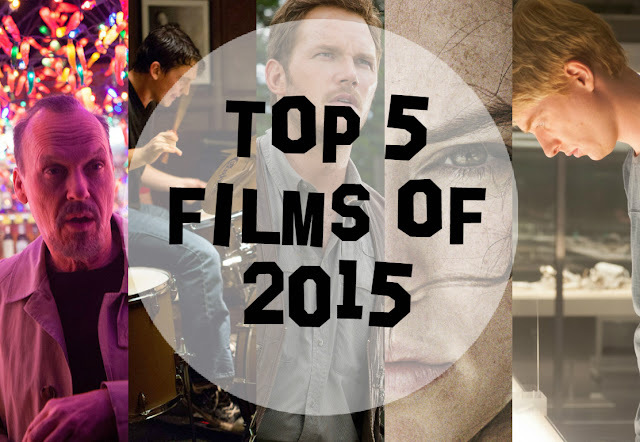 So that's my Top 5 Films of 2015. This year was a bit of a funny one as I didn't feel there were as many strong contenders as 2014 but some few good ones nether-the-less. Films which just missed out the Top 5 but are without a doubt on my Top 10 include Big Hero 6 (Don Hall, Chris Williams, 2014); Slow West (John Maclean, 2015), Macbeth (Justin Kurzel, 2015) which was phenomenal if only for it's cinematography, Mad Max: Fury Road (George Miller, 2015) and Steve Jobs (Danny Boyle, 2015). So, pretty much everything Michael Fassbender did this year? Here's to another year of incredible cinema and a salute to the ones to come in 2016. What were your favourite films of 2015? What films are you looking forward to in the New Year? As always, I love reading your comment so please do leave them below. Great list! Of the movies I've seen on here, I totally agree! I will have to go and watch Birdman & Whiplash! Jurassic world was amazing, I also really loved me earl and the dying girl this year! I loved Star Wars so much. I wasn't sure how I'd feel but boy, it sure delivered! My mother was transferred to another medical facility and her ambulance driver named Lindsay looked like she could be Daisy Ridley's twin. Her hair was exactly like Rey's, which enhanced the resemblance. She hadn't seen the movie so I urged her to see it. I have strong feelings about Whiplash. It's an abusive relationship and I'm still debating with myself and others whether the Miles Teller character became better at his craft because or in spite of what the J.K. Simmons character does. I remember we discussed Mad Max: Fury Road and I said I liked it but I had some reservations about the Mad Max character. After having seen it a few times more, I like it a lot better. When I saw first it, it was hard to understand the dialogue because of the noise in the theater so I missed some things. And George Miller has explained that the movie takes place before The Road Warrior and explains what I thought were some inconsistencies in Mad Max's behavior. I think Kingsman: The Secret Service deserves an honorable mention (it came out in the US in 2015). It played with the tropes that you find in a standard James Bond movie. It also played around with politics in that you have the Colin Firth character thinking that talent can be found anywhere vs. the Michael Caine character thinking only Oxbridge candidates need apply. Colin Firth also has an interesting scene where his character confronts right-wing Christian hypocrisy. There is also grist for people of the right-wing persuasion in that the villain (Samuel Jackson) is interested in preventing global warming by taking unusual and destructive measures. I was so excited about Star Wars because it was the first movie in a looooong time that I really liked. I thought it was really excellent. I didn't see Birdman or Whiplash. I think I've seen parts of them, but I was just never really hooked. I did see Ex Machina and enjoyed it, but kind of forgot about it after a while. I haven't, however, forgotten Mad Max. That was probably my favorite of the year. My god, that was good. I really want to see Macbeth too! I really hope 2016 does a much better job with films. I was overall underwhelmed this year. 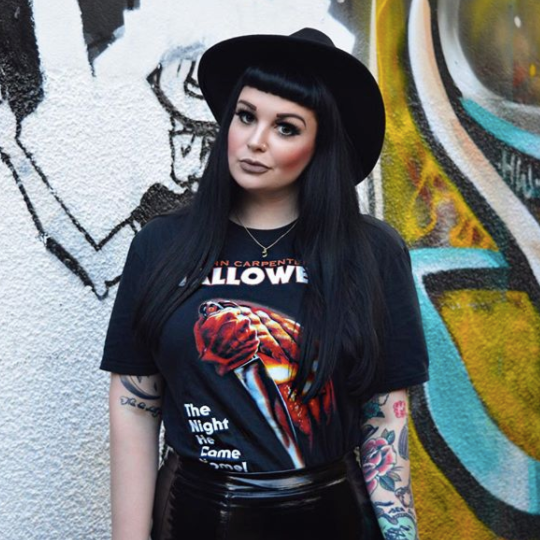 Awesome post and awesome blog! I need to see all of these! I'm going to see Star Wars in the week, I'm so excited! Happy New Year Hun! 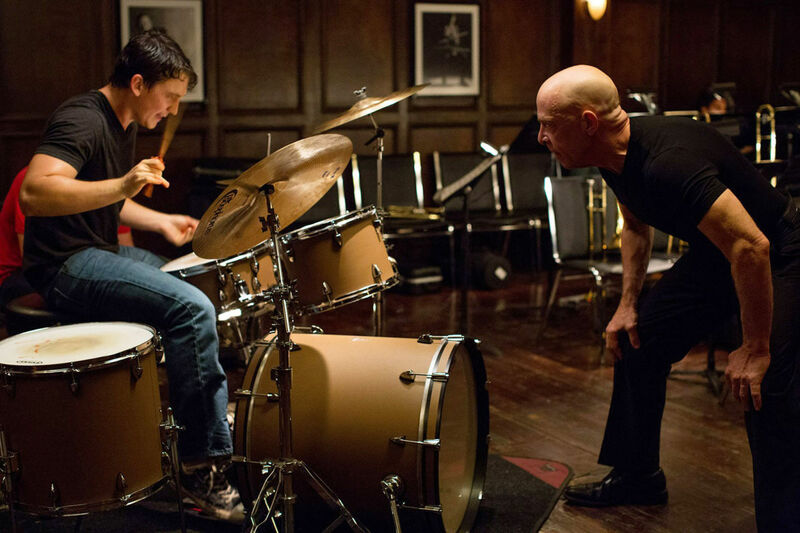 My favorite movie was Whiplash for sure!!! It was AMAZING! Birdman was great too!